Why won’t MRC or Graham Edwards accept a petition? If a mining company and its biggest investor won’t so much as accept a petition challenging their business practices, what can a community and its supporters do to ensure accountability? The lot that he’s referring to are Aussie mining firm MRC. The company recently refused to accept an Avaaz petition at their Annual General Meeting, which called for divestment from the company’s Xolobeni titanium mining project on South Africa’s Wild Coast, amidst deadly violence, which has led to the murder of four mine opponents and attacks against many more in recent years. Today, the company’s biggest shareholder, British property mogul, Graham Edwards, followed suit, as a small delegation from Marikana Miners Solidarity Campaign, London Mining Network, Gaia Foundation, Wretched of the Earth and War on Want attempted to deliver the same petition to his London office. After being asked to wait around for more than half an hour, a receptionist at Edwards’ Telereal Trillium offices informed us that no one would be available to accept the petition. The current ownership status of the Xolobeni mine remains cloudy, after last week’s unexpected announcement by MRC on the Australian Securities Exchange that they would be divesting from the project. While a clear indication that two months of active solidarity and press coverage in the UK and Australia have rattled the company (the Amadiba community has been courageously resisting the mine for nearly a decade), the terms of the company’s divestment continues to raise questions about the ultimate financial beneficiaries, if the Xolobeni project was to go ahead. A maze of shell companies, offshore accounts and arm’s length subsidiaries have made it incredibly difficult to trace the money flows in and out of Xolobeni. It seems MRC’s divestment will follow the same opaque trajectory, as they iron-out a deal in which the company sells its 56% stake in the Xolobeni mine to the South African corporate partner that they themselves created, Keysha Investments. 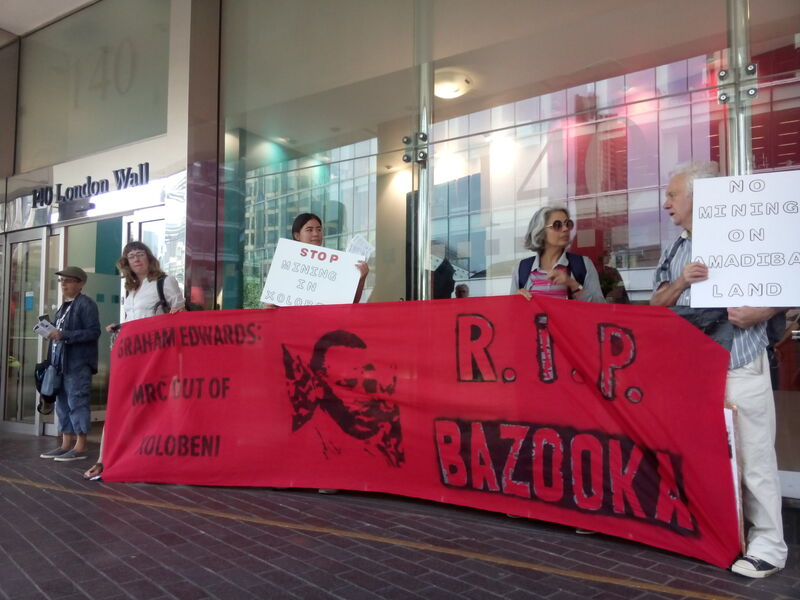 Today, the silhouette of murdered Amadiba Crisis Committee chair, Bazooka Rhadebe, emblazoned the walkways outside of Edwards’ London Wall office, as his Telereal Trillium colleagues were given leaflets explaining the violence surrounding their boss’s South African investments. He may not have received the names of the thousands around the world calling on him to divest his shares in MRC, but no doubt the whispers around the water cooler will find their way to him. For now, we’ll have to keep coming back, until our friends on the Wild Coast are confident that Edwards is no longer profiting from the proposed destruction of their territory and that he has done all he can to ensure that the Xolobeni Mineral Sands Project will not go ahead against the wishes and demands of the community. Stay tuned for the latest updates in the community’s fight to oppose mining in their territory, and what we can do in London to support their struggle.